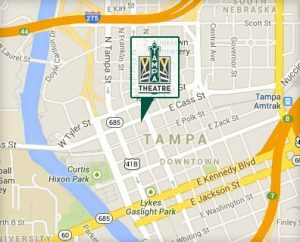 Metered spaces in the vicinity of Tampa Theatre (north of Kennedy Blvd.) are free after 6pm Monday-Friday and all day Saturday & Sunday. Before 6pm Monday-Friday, metered spaces have a two-hour time limit (four hours for disabled patrons) and can be paid by cash, debit or credit card at the pay stations or through the Parkmobile app, available at www.parkmobile.com. The closest public parking garage is the William F. Poe Garage, located about three blocks west of Tampa Theatre at 800 N. Ashley Drive between Curtis Hixon Waterfront Park and the John F. Germany Public Library. Hourly parking rates start at $1.20. Visit TampaGov.net/Parking for more information about metered spots and city-owned garages. There is a parking lot immediately adjacent to the Tampa Theatre and one on the block southwest of the Theatre (between Zack and Twiggs), both operated by 717 Parking Enterprises. These lots are NOT owned or managed by Tampa Theatre, and patrons are advised to read carefully all posted regulations and pay at the automated station as instructed to avoid ticketing and towing. All sales are final. No request for cancellations, changes or refunds is accepted. In the event that a performance is either cancelled or postponed, Tampa Theatre will make every effort to contact every patron via e-mail, time permitting. While Tampa Theatre regrets the inconvenience caused by these circumstances, Tampa Theatre cannot be held responsible for any cost or damage such postponement or cancellation may incur. Refunds on tickets purchased are made for a cancelled or postponed event only. In all instances when a ticket is refunded, only the cost of the ticket is refunded. Similarly, the conduct of events and performances for tickets purchased is the sole responsibility of the events’ organizers and venue operators, Tampa Theatre cannot be held responsible or liable for injuries, loss or damages incurred by patrons while attending these events. If your tickets are to be mailed, you should receive them within a reasonable amount of time, generally 7 to 10 days. If you do not, please contact Tampa Theatre – no later than by 5pm on the day of for a weekday performance or 4pm on a Saturday for a Saturday or Sunday performance to insure proper Tampa Theatre attention. If your tickets are to be “held at will call”, they will be at the venue box office at the time of performance. The box office is open from 10am until 30 min. after the last show of the day begins on weekdays, and from 30 minutes before the first show of the day until 30 minutes after the last show begins on weekends. It would be helpful if you can arrive early to allow for parking and to avoid the last minute rush. To pick up will-call tickets, you must bring a photo ID. If you wish for your tickets to be held for someone else, please either contact the box office in advance of the event, or instruct them to bring a photocopy of your photo ID. All patrons purchasing tickets from Tampa Theatre must do so in the light of the above terms and limitations. In accordance with Florida state law, weapons of any kind (including but not limited to firearms, knives of any size, explosives, and pepper spray or mace containers) are prohibited at Tampa Theatre. Please be aware that all persons entering the venue and their belongings are subject to search, including bag check and metal detectors. Click here for our seating chart! LONG LEGS: Seating on the orchestra (first-floor) level was recently expanded to include an additional six inches of leg room per row, whereas the mezzanine and balcony levels maintain their somewhat snug 1926 spacing. LOTS OF SNACKS: Seats in the mezzanine section (the front part of the balcony) are now equipped with small bistro tables between every other seat with plenty of space to park your popcorn and tuck your Twizzlers. During select, reserved-seating live events, these seats even feature table service from the bar! Show your ticket stub for any Tampa Theatre movie and receive a FREE dessert with any lunch or dinner entrée purchase at Bizou! Please also consider the locally-owned, independent restaurants & breweries that participate in our major fundraisers, Winefest and Beerfest. And please thank the owners, manager and staff for supporting Tampa Theatre!